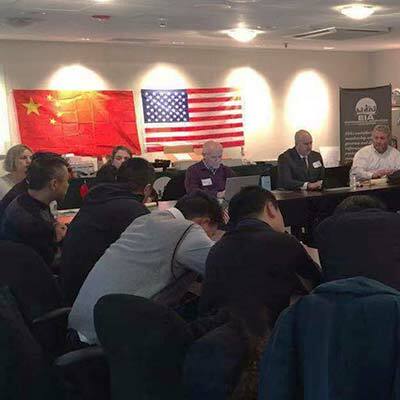 Chevy Chase, MD – March 7th, 2019 – Particles Plus CEO, Adam Giandomenico was on hand today with the Environmental Information Association (EIA) while hosting a delegation from China to discuss Indoor Air Quality, Lead Paint and other indoor environmental concerns. The delegation from China has 16 members who are visiting the United States to learn how Industrial Hygienists and Environmental Engineers approach and conduct Indoor Air Quality Studies on Buildings in the U.S.
China has particular concerns with air quality, because the ambient air pollution in the city is so bad. As buildings are constructed in China, particular attention is paid to HVAC systems and air filtration, to assure that the air quality indoors is safe for building occupants. In the U.S., we typically solve indoor air concerns by introducing more outside air to the space, since our outside air is clean. The professionals in Wuhan cannot do this. EIA has assembled a number of it’s members to participate in this meeting with the Chinese delegation, including Indoor Air Quality specialists, equipment manufacturers of testing equipment used in IAQ studies, and laboratories that analyze samples that might be collected as a part of an IAQ study. The dialogue between the Chinese delegation and the U.S. (EIA) delegation is lively and animated, even though the conversation must be facilitated by a translator. Both the Chinese and the U.S. people are learning a lot from each other, and the meeting appears to be an overwhelming success. The Environmental Information Association is a multi-disciplinary membership organization comprised of professionals involved in the identification and remediation of environmental concerns in buildings and facilities. The membership of EIA includes individual members and corporate members throughout the U.S. and Canada. The mission of EIA is to collect, generate and disseminate information concerning environmental and occupational health hazards in the built environment to property owners, interested professionals and the public. Particles Plus has been a proud sponsor of the EIA and their annual events. Particles Plus will be exhibiting and speaking at the upcoming Annual EIA Conference being held at the Miami Hyatt, in Miami Florida, starting on Monday March 25th until the 27th. Come visit the Particles Plus team on hand to answer any questions or demonstrate their particle counting and air quality measurement technologies.For more information on Particles Plus Air Monitoring Instruments and their applications, or for technical questions, product specifications or pricing, contact Particles Plus today.